The lowdown: In the vastly underrated romantic comedy My Big Fat Greek Wedding, the quiet, non-Greek parents of the groom get their first rowdy introduction to Toula Portokalos’ family and Greek culture over shots of ouzo. “Mmm, licorice,” Bruce Gray’s Rodney Miller remarks as he knocks back the first of several shots. For first-time ouzo drinkers, they sure do swallow the very strong, anise-flavored Greek aperitif with ease. The first ouzo distillery opened in Greece in 1856, but the drink’s place in Greek history goes back to the 14th century, when its predecessor tsipouro was first made by Greek Orthodox monks on Mount Athos in Macedonia. Considered Greek grappa, tsipouro is a distilled spirit made from pomace, the residue left behind on a wine press. Tsipouro is still poured all over Greece and comes in two flavors: pure or anise. Though its anise variation is similar in taste to ouzo, the base spirit used to make ouzo is higher in alcohol content than with tsipouro, so it all comes down to a slight difference in production. Nikolaos Katsaros founded the first ouzo distillery in Tirnavos—in the Thessaly region of Greece—shortly after Greek independence. By the 20th century, absinthe, which is similar in taste to ouzo, was starting to be labeled as dangerous, addictive, and psychoactive. European countries and the U.S. started banning absinthe, and ouzo got its moment. France, in particular, saw a rise in the popularity of ouzo, which is also similar to France’s anise-flavored pastis. In 2006, Greece received a European Union-approved Protected Designation of Origin status for ouzo, allowing Greek ouzo-makers to label the product as exclusively Greek. To this day, ouzo can only be produced in Greece and Cyprus (in the same way champagne comes only from Champagne, and called sparkling wine everywhere else). It’s considered more than a drink in its home country; ouzo has become a tradition intrinsically tied to Greece’s food and beverage culture. The taste: As you’ve probably gathered by now, ouzo is extremely anise-forward. But just like the very menthol-forward fernet, there’s more complexity going on after the initial taste. Unlike fernet, there’s a subtle sweetness to ouzo. It’s a little minty, smooth, refreshing. Hints of cloves, cinnamon, cardamom and fennel can come through, depending on the brand. Anise-flavored aperitifs are popular all over the world, and ouzo has similarities to France’s pastis, Italy’s sambuca, Turkey’s raki, and Scandinavia’s aquavit. If you don’t like black licorice, you’re better off skipping ouzo altogether, although some fancy cocktail bars in Greece combine ouzo with enough other flavors that the anise becomes a subtle layer. Ouzo and limoncello taste very good together. Possible gateway: Don’t make the same mistake as the Millers in My Big Fat Greek Wedding by starting off with straight shots of ouzo. The best, and most common, way to enjoy ouzo is over ice with a little water added. Water mixed with ouzo creates a cloudy microemulsion, which has come to be called the “ouzo effect.” Always drink it cold. Though called an aperitif, ouzo should always be consumed with food, not before it. In Greece, ouzo traditionally accompanies mezedes, small plates of food. It’s frowned upon to drink ouzo without some sort of food pairing, even if it’s just nuts and olives. To go full traditional, drink it with grilled octopus or prawns. 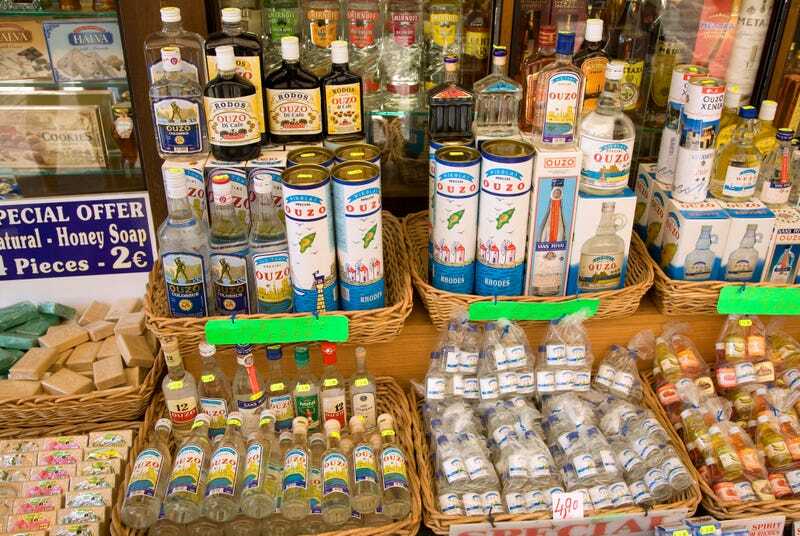 Some of the common brands of ouzo to find in the U.S. are Barbayanni and Ouzo 12. If you want to ease into ouzo, try Plomari, which is slightly more mild than most traditional ouzos, appealing to a more sensitive pallette. Next steps: There’s honestly only so much ouzo exploring you can do in the U.S. To get the full cultural experience of ouzo, you have to make the journey to Greece, where even small bars and tavernas offer a vast range of different ouzos. You can still visit the original ouzo distillery in Tirnavos. Brettos, Athens’ longest-running distillery which opened in 1909, is a must-go spot for any alcohol enthusiasts visiting Greece (in addition to the ouzo, try their brandy!). Lesvos is one of the best islands for ouzo drinking and is home to many small, family-run ouzo companies. Talk like an expert: Toasting is a big part of Greek drinking culture, but don’t say “opa!” when you’re served ouzo. Instead, say “yamas!” which more accurately means cheers (but literally translates to “health”).